A little behind the scenes on today’s Sally Forth strip. First, Francesco Marciuliano’s script for this strip. Scene: ONE PANEL. Interior, Hospital Hallway. Same Day. Long shot down the Palliative Wing Hallway. In the distance we see Ted and his mom hugging. They are crying but we don’t see really see their faces or any cartoon tears. Dot screen and lettering done digitally in Photoshop. The decision for the halo of light around Ted and his Mother was decided on as I had already done a hallway scene on October 22 where I tried to convey how you can feel all alone in a crowded hallway. 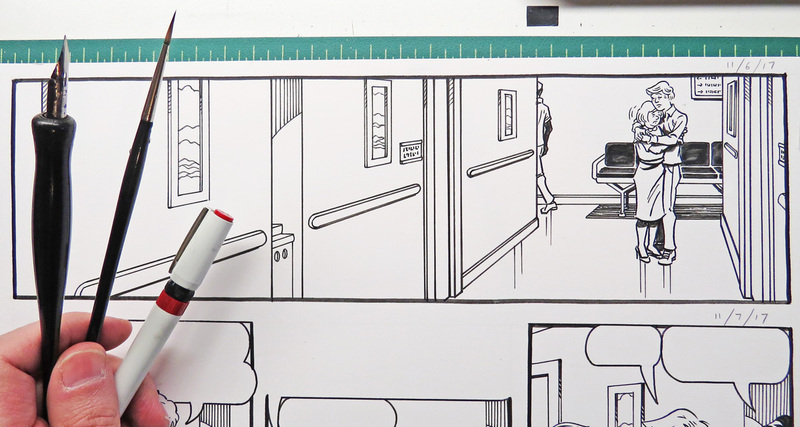 For the November 6th strip with Ted and his Mom I didn’t want to show the hallway completely empty (hospitals never are), but at the same time how the rest of the world goes away at that moment. Hopefully it read that way for the readers as well. Francesco has given me a lot of leeway on how to portray these scenes throughout. I appreciate the trust he has in me in doing so, and hope the decisions I made in the illustrations did the story he beautifully crafted justice. This entry was posted in Francesco Marciuliano, Sally Forth and tagged Ted's Dad. Bookmark the permalink. Hope this reaches both Francesco and Jim, cuz it’s now Dec. 17th, 2018. I just read the 12-15 strip – Ted at the cemetery wishing his Dad a Happy New Year and telling him how much he misses and loves him. My husband died on December 23, 2016, so it’s coming up to two years. Last year, when Ted’s dad died, I wrote to tell you how tender and beautiful the strip portrayed this event in the lives of Ted and Sally and their daughter. I was so touched – you two work beautifully together. Again, today, the expressions on Ted’s face in every scene could not match the beautifully descriptive writing any better. And I love Sally’s empathy and patience. Thank you both for bringing this sometimes crazy, but often real family to life for this lady. Congratulations, Happy New Year, and best wishes for continued success.